Westmoreland County, Penn., has contributed to our ranks another honest, and sturdy citizen in the person of Mr. Samuel S. Johnson, who came to this state and located on the west side of the river in 1847. At that date Cedar Rapids was a little village of only 300 inhabitants. Mr. Johnson is a carpenter and joiner by trade, and for a short time after coming to this place, followed that line of business. But most of his life here has been employed in that eminently useful and highly honorable employment of a tiller of the soil. His valuable farm is now included within the city limits, and is laid off into city lots where comfortable residences are to be found at this time. Mr. Johnson’s standing in the community is sufficiently attested in the fact that he has been honored with many of the offices of his township, and for many successive years. He and his wife are members of the United Presbyterian Church. Source: Carroll, Rev. George R., Pioneer Life In and Around Cedar Rapids, Iowa from 1839 to 1849, page 165, Times Printing and Binding House, Cedar Rapids, Iowa, 1895. Samuel S. Johnson, one of the most esteemed citizens and honored pioneers of Cedar Rapids, was for many years prominently identified with her leading business interests, and did much to advance the general welfare and secure the material development of the city, but he is now resting from his labors, living retired at his home, No. 311 Third avenue west. Mr. Johnson was born in Westmoreland county, Pennsylvania, July 8, 1820, and is a son of Robert Johnson, a native of Ireland, who came to the new world when a young man, and after residing in Westmoreland county for some years removed to Somerset county, Pennsylvania, where he followed farming throughout the remainder of his life. In his family were six sons and seven daughters. Samuel B. Johnson was reared on the home farm in Somerset county, and on reaching manhood was married there, but his wife lived only a short time. After his marriage he followed farming in that county on his own account until 1847, when he came west to Iowa. He found Cedar Rapids a mere crossroad village with three or four business houses. For two years he was connected with Glass & Dodge in the manufacture of fanning mills, and then turned his attention to the carpenter's trade. As a contractor and builder he erected the fist frame house on the west side of the river, which still stands as a landmark of pioneer days. Continuing at that trade for two or three years, he then took up farming. In June, 1848, he had entered a tract of one hundred and sixty acres of land near the village, and in the fall of 1850 built thereon a house and commenced to break and improve his property, making it his home for many years. One hundred and twenty acres of this tract he subsequently laid out in city lots, it becoming known as Young's third and fifth additions to Cedar Rapids. On selling his farm in 1884 he built a fine modern residence at the corner of Eighteenth avenue and Eighth street west, which was one of the best in the city. His present residence was erected in 1900. Soon after the Civil war Mr. Johnson embarked in merchandising, but at the end of a year he sold out. He was one of the organizers and original stockholders of the Van Vechten Cedar Rapids Bank, and also one of the organizers and stockholders of the telephone company of the city. He has been one of Cedar Rapids' most active and progressive citizens, and has added materially to its development and progress. Mr. Johnson was again married, in Freeport, Illinois, April 14, 1850, his second union being with Miss Catherine Gettemy, who was also born in Westmoreland county, Pennsylvania, but was reared in Ohio, and was a young lady when she removed to Stephenson county, Illinois. By this marriage was born a daughter, Alice E., wife of R. P. Taylor, of Cedar Rapids, by whom she has four sons, Howard Earl, Samuel and William, twins, and Richard. By his first wife Mr. Johnson has a son, Curtis C., a farmer of Pawnee county, Nebraska, who is married and has three sons and two daughters. Politically Mr. Johnson has been a stanch supporter of the Republican party since its organization, having voted for John C. Fremont in 1856, and for every presidential candidate of the party since that time with one exception when in the east. He has cast a presidential ballot at fourteen elections, and has been a delegate to many county and congressional conventions. He was a township trustee for twelve or fourteen years, overseer of the poor for a number of years, and served on the city board for several years. He made a faithful and efficient officer in whatever position he was called upon to fill. Both Mr. and Mrs. Johnson are charter members of the First United Presbyterian church on the west side, and he was one of the trustees of the same for a number of years. For Fifty-four years he has made his home in Linn county, and is to-day the oldest male resident of Cedar Rapids. He has witnessed the wonderful growth and development of the city, and has ever borne his part in the work of building and advancement. He helped build the first ferry boat for the town, and as an enterprising and public-spirited citizen he has been an important factor in public progress. His long residence here has made him widely known, and it is safe to say that no man in the community is more honored or respected than Samuel S. Johnson. Source: The Biographical Record of Linn County, Iowa Illustrated. Chicago, S. J. Clarke Publishing Company. 1901. p.373-375. Among the old and honored citizen of Linn county who have passed to their reward is Eli Johnston, who died in Mt. Vernon, December 7, 1898. He was born in Richland county, Ohio, April 19, 1827, and could trace his ancestry back for two centuries. His great-grandfather, Adam Johnston, and his wife, whose maiden name was Crow, came to this country from Ireland when the grandfather, William Johnston, was only four years old, and settled in Cumberland county, Pennsylvania, but subsequently removed to Westmoreland county, that state, and still later to Butler county, Pennsylvania. They had five children, all of whom were born in America with the exception of William, the others being Francis, who died young leaving no issue; Adam, John and Benjamin, all of whom lived to be old and left families. William Johnston, the grandfather of our subject, was reared in Cumberland and Westmoreland counties, Pennsylvania. He lived for a short time in Stark county, Ohio, but spent his last days in Knox county, that state, where his death occurred. He wedded Mary McCandless, also a native of Ireland, who came to the United States when only a year old. Her father was Robert McCandless, while her mother bore the maiden name of Crow. They located in Butler county, Pennsylvania, where her father followed the occupation of a farmer until called to his final rest. Unto William Johnston and his wife were born eleven children, namely: Francis, Polly, William, Susan, John, Isabel, Absalom, Adam, Robert, Sarah and James. All are now deceased. Francis Johnston, our subject’s father, was born in Westmoreland county, Pennsylvania, October 1, 1794, and grew to manhood in Butler county, that state, where he learned the sickle making business under Thomas Parks. In 1816 he married Jane Parks, the sister of his employer, and removed to Stark county, Ohio. She sickened and died while visiting friends in 1821, leaving one son, William, who was born September 24, 1819. In 1823 Francis Johnston was again married, his second union being with Mrs. Anna Snoddy. Her father, George Fleming and his wife, whose maiden name was Alspaugh, were born and reared in Ireland, and on their emigration to America took up their residence in Franklin county, Pennsylvania. They had eight children: John, Jane, Anna, William, George, Charles, Joseph and Mary. The parents and all of their children with the exception of William and Charles, died in Richland county, Ohio. Mrs. Johnston was born June 9, 1798, and first married John Snoddy, with whom she removed from Butler county, Pennsylvania, to Franklin county, that state, where Mr. Snoddy died leaving a widow and three children to mourn his loss. In 1824 Mr. and Mrs. Johnston removed to Richland county, Ohio. By their union were born nine children, namely: Mary Ann, Eli, Eliza, Robert, John, David, Sarah Jane, George and Harriet, all of whom are living with the exception of Eli, Mary Ann, Robert and Sarah Jane. Robert died March 5, 1842, of concussion of the brain induced by a fall; Sarah Jane died of consumption June 1, 1857, and Mary Ann died in the fall of 1896. Eliza, John, David and Harriet are all residents of Kosciusko county, Indiana; and George makes his home near Emporia, Kansas. In the county of his nativity Eli Johnston passed the days of his boyhood and youth, and pursued his studies in a primitive school house which had neither door, window or floor. Each pupil recited by himself as there were no classes, and the studying was done aloud. The teacher was most proficient in the use of the birch rod. Mr. Johnston was a student for one term at the Mansfield Academy and one at the Monroe Seminary, where his education was completed so far as schools were concerned. In the fall of 1847 he commenced teaching school and taught every winter with exception of that of 1870, until elected principal of the Lisbon schools in the fall of 1872. On the 13th of March, 1856, Mr. Johnston was united in marriage with Miss Margaret Jane Reed, who died of consumption February 24, 1868. This was doubtless one of the darkest clouds of his life as his family was broken up and his children scattered. They had three children, namely: Allie May, born in Richland county, Ohio, January 1, 1857, is now the widow of Warren W. Richardson, mentioned below, and a resident of Linn Grove, Iowa; Elihugh R., born in Washington county, Pennsylvania, December 29, 1860; and Jessie, born in Linn county, Iowa, June 12, 1863, was married September 25, 1884, to Rev. Hadwen William, now a resident of Elwood, Iowa. Warren W. Richardson was born in Linn Grove, near Mt. Vernon, April 21, 1853, and in childhood was known as a truthful, thoughtful and unselfish boy, and was a favorite with his companions. He was married January 1, 1880, to Miss Allie May Johnston, who was to him a most faithful companion. He died at his home near the place of his birth, June 14, 1896, honored and respected by all who knew him. In 1878 he united with the Linn Grove Presbyterian church, and always took an active and prominent part in all church work, serving as superintendent of the Sabbath school and ruling elder of the church. Upright and honorable in all things, he was found true to every trust reposed in him, and no man in the community was held in higher regard. Mr. Johnston was again married, April 15, 1869, his second union being with Miss Harriet Varner, by whom he had one son, Francis, who was born September 24, 1870, and died December 12, 1885. Mrs. Johnston was born in Linn county, four miles and a half from Mt. Vernon, January 23, 1843, and is a daughter of James S. Varner, who was born near Pittsburg, Pennsylvania, February 29, 1804, his parents being natives of the same state. He was educated in a subscription school at Chartiers, and at the age of eighteen commenced work on the river as a boat hand, later becoming master of a keel-boat. Still later he was a pilot on a steamer running down the Ohio river to St. Louis. Afterward he owned and operated a small farm in Allegheny county, Pennsylvania, and on disposing of that, in 1842, he came to Linn county, Iowa, where he secured a claim. Five years later he purchased more land and continued his residence here until called to his final rest, June 12, 1881, his remains being interred in Mt. Zion cemetery, Linn Grove. He was married at Pittsburg, in June, 1828, to Miss Ann Alsip, who was born in County Down, Ireland, February 1, 1811, and came with her parents to America in 1818; the family located in Allegheny City, Pennsylvania. She died February 22, 1875. Of the five children born to them Caroline died in infancy. Adeline, born June 16, 1836, married John H. Nulton of Mt. Vernon, Iowa, and died February 5, 1896; Francis, born September 6, 1838, was wounded in the battle of Shiloh during the Civil war, and died in the hospital at Camp Dennison, near Cincinnati, May 12, 1862. Mrs. Johnston was next in order of birth. Ann Eliza, born in Linn county, January 11, 1845, was married, March 14, 1866, to W. A. Karns, of Linn county, Kansas, and she died June 25, 1895. In 1849, Mr. Johnston removed to Indiana, where he spent three years, and then returned to Ohio. In 1853 he spent a short time in Iowa, teaching one term of school and then returned to Ohio. In was in 1858 that he removed with his wife and child to Keokuk county, Iowa, and in the fall of the same year came to Linn county. In 1861 he purchased forty acres of land, and to it he subsequently added eighty acres as his financial resources permitted. Many times after the day’s work was done in the school room he went to the timber, cut his load of wood and returned to his home by moonlight, not completing his day’s work until far into the night. With his election to the principalship of the Lisbon schools the field of his labors as an educator widened, and renting his farm he devoted his entire time to teaching. During his second year there, in the fall of 1873, he was elected county superintendent of schools on the Republican ticket, and filled that office most creditably for eight years. He was an able and competent instructor and displayed excellent judgment in the choice of instructor for normal institute work. After his retirement from office he and his wife taught in the public schools of Western, this county, for two years. The college having recently been removed to Toledo, there was a demand for a high school there, and he was chosen as teacher of the same. The following two years were spent in traveling over the country with a team and wagon in the vain endeavor to restore the health of his son, Frank. The family traveled all over Nebraska and Kansas, almost as far west as Colorado and as far south as Indian Territory, but death finally claimed the boy and on December 12, 1885, at the old Varner farm in Linn Grove. Worn out by the long vigil at the bedside of his dying boy, Mr. Johnston made no effort to follow his profession except teaching an occasional term of a country school for over four years. About two years of this time were spent in Mulvane, Kansas. In the summer of 1889, Mr. Johnston received a commission as superintendent and Mrs. Johnston as matron of Dwight Mission, Indian Territory, this being an academy for the education of full blood Cherokee Indiana, under the management of the Presbyterian Board of Home Missions. For four years they continued this work, when feeling the weight of many years he laid down the work he had carried on so faithfully for so long a time and retired permanently from the profession. Throughout life Mr. Johnston was an earnest and consistent Christian gentleman. He was reared in the rugged faith of the Associated Reform church, to which his parents belonged. He became converted in Indiana in the winter of 1850-51, under the preaching of the Rev. 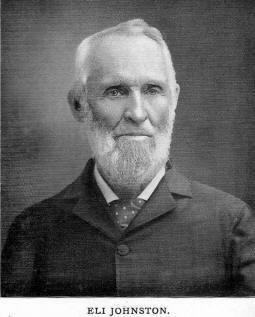 Clevinger of the United Brethren church, and for about eight years held membership in the Baptist church, but on coming to Iowa, in 1858, he and his wife united with the Presbyterian church at Talleyrand, Keokuk county. Removing to Linn county, in the fall of that year they transferred their membership to the Linn Grove Presbyterian church, with which he was connected for forty years. In the meantime, however, he was a member, temporarily, of the church at Mulvane, Kansas, and Dwight, Indian Territory. For the long period of twenty years he was superintendent of the Linn Grove Sunday school, and as his services in that line were always in demand, he has been known to have conducted his own school in the forenoon and two others in the afternoon. During his labors in Indian Territory he was licensed by the Presbytery of Cherokee as a lay evangelist. He was a most entertaining companion, being fond of a good story with a point or moral to it, and few could tell one better, while his wit was of the genuine Irish kind, always ready and always pat. His influence was great and always for good, and his sympathy, his benevolence and his kindly greeting, will long be remembered. His duties were performed with the greatest of care, and throughout his life his personal honor and integrity were without blemish. Source: The Biographical Record of Linn County Iowa, Illustrated, Chicago: The S. J. Clarke Publishing Company, 1901, pages 210-215. The subject of this review, who is a worthy representative of the agricultural interests of Marion township, Linn county, Iowa, was born in Ross county, Ohio, on the 6th of July, 1843, a son of John H. and Mary (Carmeans) Jones, who were also natives of that state, the former born in Delaware county, the latter in Ross county. The family continued to make their home in the Buckeye state until the fall of 1845, when they came to Linn county, Iowa, and took up their residence on section 3, Marion township, where the father secured a tract of government land. Our subject's paternal grandfather, Robert Jones, also came with the family to this county and took up land, they together owning two hundred and ten acres. In 1857 the family returned to Ross county, Ohio, where our subject passed the following seven years, and then again came to Linn county, Iowa. In the fall of 1869 he was joined by his parents, and here the father died in 1870. The mother has since made her home with her children, and she and her youngest son, J. E., own the old homestead in Marion township. In the family were seven children, namely: William Allen, of this review; Merritt, who died at the age of nineteen years; Susanna Jane, wife of William Hizer, of Johnson county, Missouri; Louisa, wife of B. F. Richards, of Marion; Addison, also a resident of that place; Adelaide, wife of David Gilmore, a farmer of Marion township; and J. E., also a farmer of that township. During his boyhood and youth William A. Jones received a common-school education, and remained at home until he attained his majority, following different occupations. On the 25th of February, 1869, he led to the marriage altar Miss Matilda Hunter, of Cedar Rapids. Her parents were William and Mary Jane (Howe) Hunter, natives of Pickaway county, Ohio, who came to Linn county, Iowa, in 1841, and settled in Rapids township, where her father engaged in farming for some years. She died in October, 1882, and he departed this life in March, 1892. After his marriage Mr. Jones commenced farming on his own account, and in 1869 purchased fifty acres of land on section 34, Marion township, to which he has since added until he now has one hundred and eighty-five acres of land. Of this amount he has placed fifty acres under excellent cultivation, and in connection with its operation has successfully engaged in raising horses, cattle and hogs. He also deals in wood, and in his business undertakings has been quite successful, having always been a hard working, industrious man, and upright and honorable in all his dealings. He built his present home in 1869, and erected his barn in 1882. The neat and thrifty appearance of his place plainly shows that he is a man of good business ability and sound judgment. In his political views he is a stanch Democrat, and both he and his wife are earnest and consistent members of the Christian church. Source: The Biographical Record of Linn County Iowa, Illustrated, Chicago: The S. J. Clarke Publishing Company, 1901, pages 45-46. There is probably no man in Maine township wider or more favorably known than Chandler Jordan, who came to Linn county in pioneer days, and is recognized as one of the important factors in its progress and development. He is a native of Maine, born in Danville, Cumberland county, March 2, 1820, and is a representative of a prominent old New England family, which was founded in this country by Rev. Robert Jordan, who came from England in 1640, at the age of twenty-nine years, and settled at Cape Elizabeth, near Portland, Maine. His descendants became prominently identified with the growth and upbuilding of that state. Ebenezer Jordan, the father of our subject, was also a native of Cumberland county, Maine, his birth occurring at what is known as the Pejepscot claim, on the 30th of November, 1789. He received a good common school education and followed farming throughout life. During the war of 1812 he took up arms against the mother country. Twice he visited Iowa, but continued to make his home in the old Pine Tree state until called to his final rest December 4, 1873. His wife, who bore the maiden name of Sarah Dyer, was born in Maine December 19, 1791, and died February 4, 1864. Unto this worthy couple were born ten children, of whom George died at the age of ten years and James at the age of twenty-one. The others were as follows: Lemuel D., born in 1813, came to Linn county, Iowa, in 1840, and was engaged in farming in Maine township until his death in 1890; Mary D., born in 1815, married John Penley and died in Maine in 1841; Charles, born in 1818, was a dry goods merchant of Boston, but purchased land in this county and died at the home of our subject in 1854; Chandler is the next in order of birth: Ebenezer, born in 1822, still lives near the old homestead in Maine; Nelson, born in 1824, was engaged in the railroad business nearly all his life, but was following farming in Kansas at the time of his death in 1894, and his remains were interred in Maine township, this county: Rishworth, born in 1826, died in Maine in 1889: and Lydia B. born in 1832, married Moses Chapman and died in Maine. The children were educated in the public schools and academies of their native state. During his boyhood and youth Chandler Jordan pursued his studies in the common schools and the academy at Lewiston, Maine, and remained on the home farm with his father until twenty-two years of age, being engaged in school teaching during the winter months. Coming to Iowa in 1844, he located in Maine township, Linn county, where his brother had settled about four years previously. At that time there were but few settlements in the neighborhood and not an acre of land had been entered in the township. There were no railroads in Iowa, and from Chicago our subject traveled overland by wagon. The day-book which he kept in those early days was the only record kept in the township, and has been used as authority in settling many a dispute. Mr. Jordan took a claim in Maine township, broke the prairie with oxen, and improved his farm. His first purchase consisted of one hundred and sixty acres, and as he succeeded in his farming operations he added to it from time to time until he now controls nine hundred acres in that township, the greater part of which he himself has improved. He had but limited means on coming to this county, but has steadily prospered, and is to-day one of the most extensive farmers and wealthy citizens of this community. On the 2nd of June, 1847, Mr. Jordan was united in marriage with Miss Sarah D. Waterhouse, who was also born in Cumberland county, Maine, June 27, 1824, a daughter of Zebulon and Anna (Dyer) Waterhouse. The mother died in 1835, and in 1854 the father came to Linn county, Iowa, where he departed this life in 1879, at the age of eighty-four years. Mrs. Jordan was reared and educated in her native state. Of the seven children born to our subject and his wife only two are now living, namely; Lydia B. born in 1855, is the wife of Rev. Eli Packer, a Baptist minister of Des Moines, Iowa. Julia J., born in 1861, is the wife of John N. Dunn, who lives on the home place, and they have three children, Julia A., Lewis J. and Jessie S. Those of the family now deceased were Anna, who died at the age of four years: two who died in infancy: Elizabeth A., who died at the age of four years: and Emma E., who married Dr. Woodbridge and died at the age of thirty-three, leaving three children, but one died soon after the mother's death, those living being Chandler J. and Edward E.
In politics Mr. Jordan is a Democrat, and has taken quite an active part in public affairs, filling various township offices. During almost his entire residence here he has been officially connected with the schools, had control of all the school territory and for many years he was school treasurer, and held the money to pay the teachers. The first school in this part of the county was established in Jackson township, and when a neighborhood became large enough to support a school others were started. Mr. Jordan has been a life-long member of the Baptist church, and was instrumental in founding the church at Jordan Grove. He superintended its construction and has always been an officer of the same. He is now the oldest living resident of Maine township, but is still quite active and enjoys good health. His life has been manly, his actions sincere and his example is well worthy of emulation, and he is certainly deserving of honorable mention among the prominent pioneers and representative citizens of his adopted county. Source: The Biographical Record of Linn County, Iowa Illustrated. Chicago, S. J. Clarke Publishing Company. 1901. p.726-728. There is probably no one in Cedar Rapids better known to the traveling public than Charles R. Jordan, now station master at the union depot for the Chicago & Northwestern and the Burlington, Cedar Rapids & Northern Railroads. He was born in Oswego, New York, October 24, 1853, and is a son of Patrick and Margaret (Gallagher) Jordan, who were natives of county Mayo, Ireland, and came to this country about 1848, their marriage being celebrated in New York. Throughout his active business career the father followed the stone cutter's trade. He died in Minnesota, and his wife, who survived him a few years, passed away at Cedar Rapids in 1878. They were the parents of nine children, but only two are now living, namely: Charles R., the subject of this sketch; and Mary A., also a resident of Cedar Rapids. Charles R. Jordan obtained his early education in the public schools of Owatonna, Minnesota, and Cedar Rapids, Iowa, having removed to the latter city with his mother in March, 1872. While still in school he worked for George Holcomb, who was then proprietor of the old depot eating house, and after completing his education he remained with them until 1875, when he was appointed night ticket clerk and depot policeman for the Burlington, Cedar Rapids & Northern and the Chicago & Northwestern Railroads. Later he became identified with Mr. Mather in conducting the eating house at the depot, and in 1888 purchased his partner's interest and continued in business alone. In 1897 he was appointed to his present responsible position as station master, the duties of which he has since performed in a most capable and satisfactory manner. In January, 1901, he became interested in Hotel Burley at Belle Plaine, Iowa, - a house of forty-two rooms, - of which he owns a half interest as a member of the firm of Jordan & Barnicle. He also has farming property in Western Iowa. At Cedar Rapids, in December, 1880, Mr. Jordan married Miss Katherine Strawney, who was born in Du Page county, Illinois, in 1849, and they became the parents of three children, of whom one died in early childhood. Charles R., Jr., is now manager of the depot eating house at Cedar Rapids, of which his father is sole owner; and John H. is attending school at Georgetown, D.C.
By his ballot Mr. Jordan supports the men and measures of the Republican party, but has never been actively identified with party work. In religious belief he is a Catholic. He is a member of the blue lodge, chapter, commandery and consistory of the Masonic fraternity, and is also connected with he Benevolent Protective Order of Elks. He served on the building committee and is a stockholder of the new Masonic Temple at Cedar Rapids. He has always been a supporter of philanthropical and charitable enterprises and is recognized as a valued citizen of the community. Source: The Biographical Record of Linn County, Iowa Illustrated. Chicago, S. J. Clarke Publishing Company. 1901. p.390-391.